Fortaleza de Sao Sebastio de Bacaim i.e. The fort of St. Sebastian of Vasai. Or simply as we call it ‘Vasai cha Killa’ has a great story behind it. The architectural wonder built by Bahadur Shah, Sultan of Gujarat, left Vasai with historic importance. 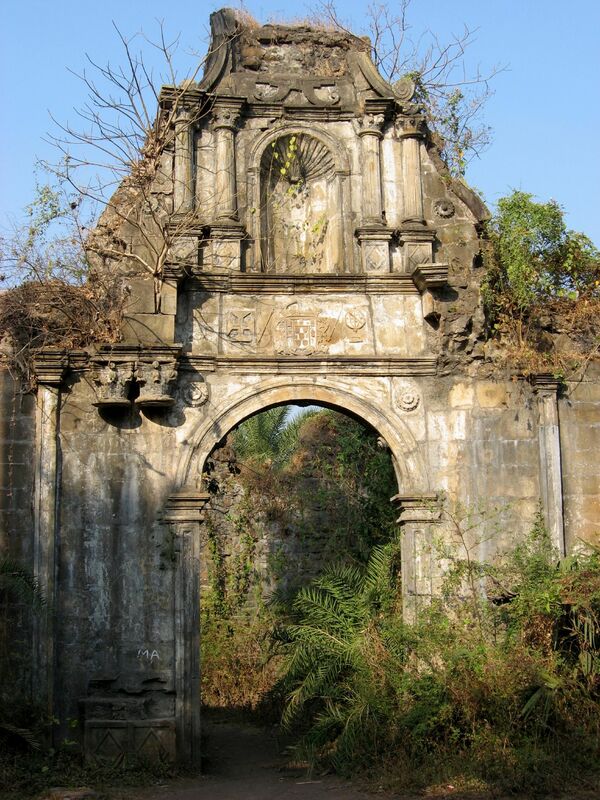 Modernity met the rich centuries of the past, The Vasai fort still resonates with the footfalls of marching history. The purpose behind building this huge structure was to keep watch over sea invaders. Main gate of the fort leads to a small courtyard, from where one can climb the battlements and can take a look over the creek. In 1535 Gujarat Sultan admit defeat to the Portuguese. They then captured the fort and remodeled it by building bastion inside. The fort was made the “Corte da Norte” or “the northern court” of Portuguese dynasty, the second only to the city of Goa. There were 7 churches built inside the fort out of which 3 are still in recognizable condition. Later, in 18th century Maratha army under the leadership of Chimaji Aappa attacked the fort after a three year old struggle. Maratha’s could hold on the territory only for a short time, as British took the fort as the price of supporting one splinter group of Marathas against another. Fort then remained under the territory of British for a long time.Though The Fort of St. Sebastian of Vasai is in ruins, but still there are watch towers standing still with safe staircases leading up. Even today the structure gives a good idea of the floor plan, preserved barrel-vaulted ceiling, carved stones, some weathered beyond recognition, others still exhibiting sharp chisel marks. Though the root of the trees has damaged the structure, but still it is a great experience to sit and listen to the stories flowing in the air.Fort of “Jaldurg” or “Arnala Fort”. Is built on a small island off fishing village of Arnala. The name given by Portuguese who rebuilt this fort called it “llhas das vocas”. In 1516, a local head of clan Gujarat, Sultan Mahmud Begda originally constructed the fort on the island located at the mouth of Vaitarna river. The Portuguese chief of Bassein donated the island to a Portuguese nobleman who tore down the old fort and began construction of 700 sq. foot fort. Though the fort was never completed by the nobleman, it remained under Portuguese control for two centuries, and used to control shipping and navigation along the northern edge. After winning the Battle of Vasai , his general Shankarji Pant, persuaded Chimaji to launch an assault on Fort Arnala, for its strategic importance to the Maratha Navy in assaulting Portuguese interests. Their first assault , co-ordinates with a Maratha naval force commanded by Manaji Agre, was routed by a superior Portuguese naval force. A second assault on the fort on March 28, 1737, caught the Portuguese by surprise and forced them to abandon the fort. The victory was commemorated by a commemorative inscription on the northern wall of the fort and is still visible today. The Marathas then rebuilt the fort, constructing three citadel Bahirav, Bhavani and Bava. The Marathas controlled the forth until 1817 when, Marathas were forced to surrender the fort to the British due to superior naval power of the British. The Arnala and the Bassien forts were returned to the Marathas by the British in the treaty of Salabai, but the forts again changed hands under the treaty of Pune. Even today, the watch tower on the outer wall, large hexagonal fresh water reservoirs, temples of Ambakeshwar, Goddess Bhavani, Lord Shiva, and the tombs of Shahali and Hajjali, the solid stone doorway which is adorned with pictures of Tigers and Elephants and the external ramparts are in a fairly good condition.Today the fort is sadly in a state of disrepair and sheer neglect. Vasai -Virar Municipal Corporation (VVMC) has presented its first budget of 810 crore for ‘Destination Vasai’ on Wednesday. The focus will be on restoring and maintain of Chruches, forts, tourist and picnic spots. The funds for these projects will come from existing taxes, including property tax, LBT, water tax and fire service tax.